From an outside perspective, BASIS Independent Silicon Valley may often appear as a school with a singular goal: achieve high results on academic assessments. Our national and international test scores speak for themselves, and they have helped us become one of the most sought-after institutions of primary and secondary education in the world. However, the noise made by this measurable data can often overwhelm what else is happening in our halls. We are a school that values a diversity of student desires and passions, and we actively encourage students to create the best culture for their own learning and growth. And creating this culture is exactly what they are doing.In the 2014-2015 school year, BISV was a new school. The English department decided to start a Journalism club to test if any students were interested in researching and writing about the news. Some of these students were so passionate about this field that they begged for it to become a class, and the next year we started a Journalism elective. The enrollment for this class has consistently grown, and we recently published our very first full-length newspaper. Although we as teachers are excited to teach this course, it is really the passion of the students that made it happen. 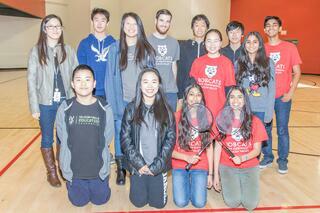 At the end of the inaugural year at this school, I was also approached by students and asked to coach a badminton team. I had no experience playing badminton and I warned them that I was not the ideal candidate. Undeterred, they begged. They pleaded. They whined. Finally, I succumbed, and offered to start a team the next year. My students rose to the challenge. They promoted the team, designed practices, led drills, and kept each other accountable. The students’ dedication is formidable, so much so that they are starting a competitive season this year. As teachers, we serve one primary purpose: we are here to support our students. We are here to educate them and to provide an environment in which they can fulfill their highest potential. And at this school, that environment is most noticeable when students take charge and make change happen. They have pushed for a wider variety of classes, inspired competitive athletic teams, and started enrichment clubs and activities. If we can continue providing the opportunity for students to lead, then our school will continue to set the standard for education around the world. To find out more about BASIS Independent Silicon Valley, join us for an information session. Register today!